Tesla Inc (NASDAQ:TSLA) reported first-quarter earnings Wednesday afternoon. And while Apple Inc. (NASDAQ:AAPL) may have been the focus of Wednesday’s regular trading session, once 4 p.m. ET came around, all eyes shifted to Tesla. Ultimately TSLA stock fell 4.76% to $287.46 in after-hours trading. On the surface, the numbers looked good. Tesla beat on earnings per share, revenue and gross margin estimates. That’s great! The company also lowered its CapEx estimates for the year from $3.4 billion to less than $3 billion. But there were issues too. For starters, Tesla saw its cash balance shrink from $3.4 billion in Q4 to $2.7 billion in Q1. That $700 million (20%) draw is significant for just three months of business. Even worse, debt grew from $10.3 billion to $10.8 billion (~4.85% increase) quarter-to-quarter. Higher debt and lower cash is never a great sign, even if Tesla is in the midst of a hiring spree to jumpstart production, (more on production in a minute). It’s certainly one of the more memorable conference calls for me, where CEO Elon Musk literally cut off an analyst for a “bonehead” question, before ignoring another. While many executives likely think this, most aren’t willing to say the questions are so “dry” that it’s killing them. And that’s before turning to a shareholder tuning into the call from YouTube to ask a number of questions. To be fair, I sort of like the transparency that Musk & Co. gave “the little guy” shareholder, who fielded a number of questions from others to ask the Tesla team. But given the wide-ranging concerns engulfing Tesla at the moment, I don’t think that was the most responsible thing a CEO could do at the time. Other notes on the call? The company expects to be cash flow positive and profitable — on a GAAP basis! — in Q3 and Q4. When asked by Morgan Stanley’s Adam Jonas about a potential capital raise, Musk said he “specifically doesn’t want to.” I’m not sure how Tesla plans on getting to profitability in H2 2018, but in management’s mind, it’s still doable. Although, they also said the company plans to restructure this month to allow for that, so we’ll have to see how that works out. I’ve been pretty consistent when talking about Tesla, saying that it’s finances and production of the Model 3 are the main focus. For better or for worse, the two also go hand-in-hand. With a better financial position, Tesla could afford to take things slow and get production of the Model 3 correct. Conversely, if Model 3 production was going smoothly, it would be in a much better financial situation. 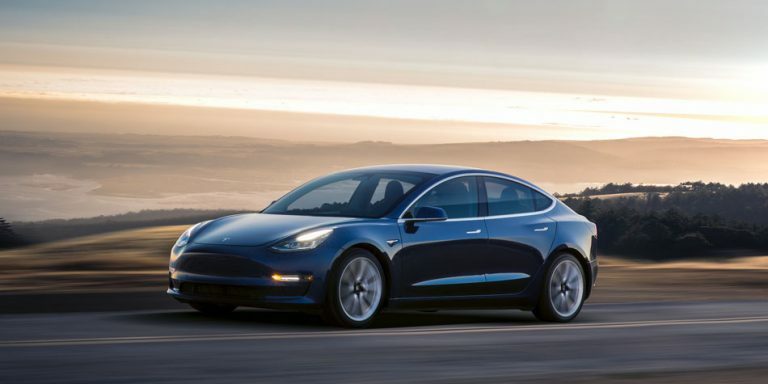 All that said, Tesla said it still expects to produce 5,000 Model 3 units per week by the end of Q2. It also expects to deliver roughly 100,000 Model S and X vehicles this year. Ultimately, management is still aiming for the Model 3 to garner 25% gross margins in 2019. The only issue? It’s putting its automation plans on hold and hiring a ton of manual labor to complete the process — to the tune of 400 workers per week for several weeks. That can’t have a positive impact on gross margins, although management says it’s only temporary. On the call, Musk discredited a Reuters report from last month that said the Model Y would begin production in November 2019. He said about 24 months from now would be a more accurate timeline for Model Y production. Until that line was muttered, the stock was holding up in after-hours trading. Afterwards, it took a ~5% tumble. Back in early April, I said investors should keep it simple with Tesla. Over $300 was good and below was bad. After chopping just below that level over the past few weeks, TSLA stock opened far below it on Thursday — at $277. If shares fail to break back through $300, a retest of the recent $250s lows is back on the table. The bottom line: I’m not a buyer until I can see a clear trend or support line in TSLA stock. At this point, I feel that Tesla needs to prove to investors that it’s a worthwhile investment. Prove to us that it can hit its production targets, prove that it can be cash flow positive. If it can, then it’s worthwhile to consider an investment. But until then, we’ll have to see. Bret Kenwell is the manager and author of Future Blue Chips and is on Twitter @BretKenwell. 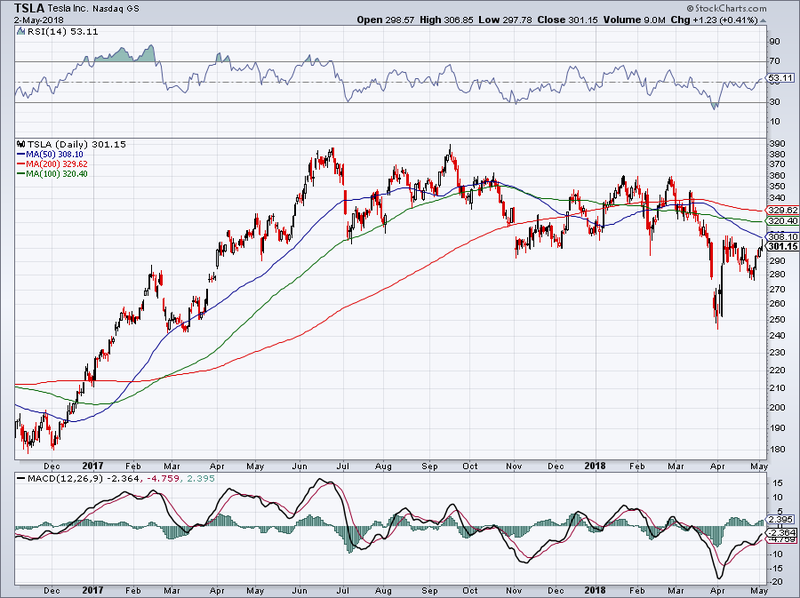 As of this writing, Bret Kenwell held a position in AAPL. Article printed from InvestorPlace Media, https://investorplace.com/2018/05/tsla-stock-earnings/.